Todd Gilson borrows a Disney term when describing the latest opportunity for Honors students at NIU. That’s how Disney World promotes the wristband guests can use for nearly all of the park’s transactions. And that’s how Gilson, the director of the Honors Program, would like the experience to be for Honors students headed to graduate school. “We want to make it as frictionless as possible,” Gilson says. New partnerships between the Honors Program and at least four NIU graduate programs–with plans to add more–will provide guaranteed admission to undergraduate Honors students as space and program-specific criteria allow. Along with locked-in spots, students can apply to have their graduate program application fees reimbursed. Only a few out of about 130 peer institutions throughout the country offer similar incentives. Participating graduate programs so far include Accountancy, Political Science, the Global MBA Program and most of those offered in the Department of Kinesiology and Physical Education. Now, a fourth key benefit can be added, Gilson says. “I can point to a page in the catalogue and say, ‘This is something we have’; it is now the fourth pillar of benefits for students,” he says. 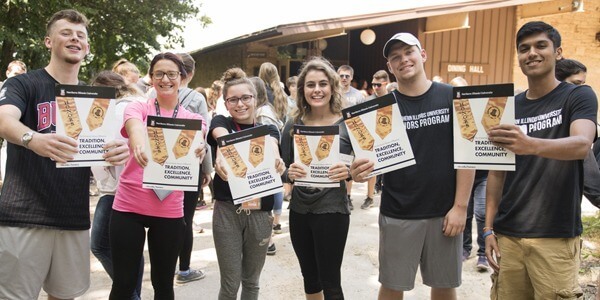 Through the partnership, University Honors students are eligible for reimbursement of their application fees through AcademicWorks once they’ve submitted their applications to their chosen programs. About 1,000 students participate in the Honors Program. They’re encouraged to study abroad, network with top NIU alumni, participate in special events (such as trips to Broadway in Chicago) and conduct original research with faculty members (beginning as early as freshman year). This latest initiative gives them a direct link to graduate programs. Master’s degrees help position students for career advancement, and this partnership provides a larger pool of recruits. For the Global MBA Program, that could mean more students from typically underrepresented fields, such as those relating to STEM, says Balaji Rajagopalan, dean of the NIU College of Business. It also brings a greater awareness of the program, which “truly is a life-altering experience” for those involved, he says. Students in the Global MBA Program not only benefit from the curriculum itself, but everything else that comes with it, says Anthony Preston, director of Global Programs. Students participate in developmental workshops, career coaching and mentorship programs. Through a partnership with Mango Languages, students have access to online training in more than 200 languages. Newspapers from throughout the world are brought to class, and students are given the opportunity to earn two degrees–one from NIU and a Masters in International Management from Sapienza University in Italy. Attracting NIU’s “very brightest and best” benefits all involved, Preston says. In the Department of Political Science, three spots will be set aside each year for Honors students who meet the requirements. Many don’t realize about 16 percent of the workforce works for government at the local, state and national levels, says Scot Schraufnagel, chair of the Department of Political Science. Many of the jobs, such as those with the FBI, the United States Secret Service and the United States Foreign Service, require advanced degrees. “Increasingly, employers are looking for employees who have advanced degrees, and this allows NIU students to accomplish that in as little as five years with appropriate planning,” Schraufnagel says. Depending on the year, graduate degree spots in the Department of Kinesiology and Physical Education, also can be competitive, especially in Sports Management, says Chad McEvoy, chair of Kinesiology and Physical Education at NIU. Class sizes are kept reasonable to ensure students receive individual attention. The partnership also makes sense for Accountancy, which has a national reputation as a Top 20 graduate school program largely due to the quality of students enrolled, says Bradrick Cripe, assistant chair of the Department of Accountancy.